Some have arrived at the idea from working on traditional farms, and others from a commitment to farming as sustainably as possible, but all share a sense that the farming of the future will be smaller scale, more closely linked to their community, and will involve, in part at least, working horses. One of them, when asked why he likes working with horses replies “because it just feels right, it just feels good – when everything’s clicking together”. Until the 1930s, the horse was an essential part of any farming operation. Then as tractors arrived, they vanished within a very short time period. The knowledge, the infrastructure, the skills that made horsepower possible largely disappeared, surviving, in the US, only with the Amish, a handful of enthusiasts, and historic ‘museum’ farms run as tourist attractions. The film follows three quite different young people, all of whom have come into contact with working horses and feel that learning to work with them is an important thing to do. It visits them over the space of the year as they try to work out, through hard work, early mornings and frustrating relationships with farm-owners, whether this is what they really want to do. It is often said that in Cuba, during the Special Period, the country went from needing 1% of its population working in farming to 20%. If the same thing is applied to the UK in the event of an energy famine, we would need around 8 million new farmers. There are already a number of young farmers inspired by the possibilities of more localised food production and by the idea of rethinking farming for a leaner future, but there need to be a lot more. What needs to happen, it seems to me, is for farming to become something that young people care about, are inspired by and intrigued about. That, for me, is the most moving aspect of this film. These are ordinary people, seized by a deep sense of what farming could be. ‘Escape from Suburbia’, the sequel to ‘The End of Suburbia’, followed several people through their own peak oil preparation efforts. For me, the problem was that apart from one, within the first few minutes of the film I found that I wasn’t really engaged by them, and not really that interested in their stories. ‘The Farmer and the Horse’ is very much the opposite, each of the people followed are fascinating in their own way, and Flesher leaves in enough detail about their lives to keep the viewer intrigued. I found by the end I cared very much about them and what they did next, because I felt like that had put so much effort and passion into learning these skills that I actually wanted the farming of the future to stand on them as foundations, with their passion, commitment, determination that smaller scale, lower impact farming can be viable, and with their dedication to acquiring the skills and to seeking out those who can teach them. This is a film that doesn’t romanticise horsework. One of the most memorable sections is from a horsepower course somewhere where we see a number of people having their first experience of ploughing with horses with hilarious results. 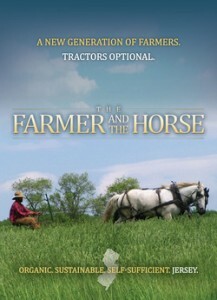 All of the people in the film know that working with horses is hard work, that they have good days and bad days, and that getting into farming in a way that is viable is going to be hard work. But in a world where getting into farming requires not just land, but a huge amount of start-up capital, working with horses offers a lower-cost way in and makes the difference between being able to get started or not. I can’t recommend this film highly enough. As a reality TV show following three people in pursuit of a dream understood by few of their family and peers it is compelling, as a vision of how farming might be in a lower-energy world as a new generation of young farmers come to the fore it is fascinating, and as a chronicle of how cheap energy has changed and indebted agriculture it is sobering and thought provoking. I enjoyed every minute of it, and it certainly presents the story of what farming may well look like in the future, as well as what the first steps towards getting there might look like, in a very entertaining and accessible way. It felt like a film you could show to anyone, interested in peak oil/Transition/sustainable farming or not, and they would find it fascinating and thought-provoking. You can order DVDs of the film here. Excellent! Thanks for bringing that to my attention. Maury Telleen edited the Draft Horse Journal for many years, and American quartely publication. In 1977 he pulled together a number of articles into “The Draft Horse Primer”. Maury relates that the US Department of Agriculture colluded with tractor manufacturers to make the American farm more ‘modern’ in the 1920s and 1930s. Tactics included taking work horse teams in trade as down payments for tractors. The relationship today of the USDA with Monsanto and other seed, pesticide, and fertilizer conglomerates is reminiscent of that attack on the farm horse. The Small Farmers Journal edited by Lynn Miller from Sisters, OR, USA, and Rural Heritage magazine also serve small farms interested in work horse and old-tradition methods. These journals also include articles on working and training oxen (steers of any breed of cattle, four years of age and older, trained to draft work). Former editor of Rural Heritage magazine, author Gail Damerow, told me ten years ago that oxen were preferred in the Tennessee hills of Jackson County – that on slopes the oxen were more sure-footed, and often did more work, than the often quicker-moving work horses. We got horses here just a year ago. I’m afraid I do see the “old fashioned” farming with horses as a thing of the past- it takes 40 acres of ground to feed a horse, so they tell me; most of it hay; a little of it grain; all of it work. Trying to make it all pencil out in any row-crop system is perhaps not impossible, but not easy, either. But we don’t grow row crops, we’re proponents of Woody Agriculture (which is really not Permaculture). And we think the horses may fit here very nicely, in fact; better than with row crops. The thing is, with any woody crop, bush or tree, you still have spaces between trees/bushes, sometimes wide aisles. Grass, and other stuff, grows there. And you have to keep it short, somehow, if you actually want any harvest from the trees. We used the horses last fall, with moveable electric fence, to clear the ground under our big chestnut trees before harvest. I’m seriously thinking they did about $2,000 worth of work for us, in 5 days; that’s my guess for fuel and labor if we’d had to mow and chop using machines and humans. We also expect to use them for light draft; hauling nut crops during harvest, hauling wood and timber when we harvest those. Those are actually lousy jobs for machines; diesel or gas, you only run the engines for very short times; stop and go; giving you the worst mileage and most engine wear possible. The horse can stand and eat while waiting. It may work. Thinking about a donkey or two, also. I am told that the usual work horse was a ‘chunk’, a cross of light horse and draft breeds. The chunk was a bit more versatile, a little more comfortable to ride, maybe not as strong for a heavy pull, but not needing as much groceries, either. Mules fill similar roles, from crosses with light horses to the draft breed cross mules. Putting a harness on a general purpose light horse breed won’t offend anyone, except the horse during training, but he should get over that (unless you use him for racing!). Just as with getting 40 acres worth of draft horses to farm 50 acres is of questionable value, tractor farmers can get into trouble buying too much tractor for their use. More tractor/horses means heavier equipment or you spend all your time on repairs and the big equipment isn’t as agile. Orchards are traditional places to use the horse and sheep for grooming, fertilizing the trees, and even aerating the soil. According the Draft Horse Primer, the rocking motion on the ground as the horse’s foot hits and rolls forward during the step actually loosens the dirt, overall (except the lump where the foot just touched), where a tractor (or wagon) tire will just create one continuous compacted strip across the field. Don’t forget the noise of the tractor, which isn’t good for the nervous system, and the need for regular breaks that comes with the horses rather than the ever-driving, USDA/Monsanto sanctioned ’14 hours continuous’. I never saw a coffee cup holder on a horse rig. That was a bucket with lunch and water for the horse, if you were going to be a ways from a place to water. Working horses, I am told, is different farming, not just ‘row crop’ tractor farming with a different pulling mechanism. For those looking into working horses, don’t overlook the Forecart, an industrial-strength almost-cart farm implement that you hitch the horses to, and has a tractor-type drawbar for tractor-type implements. It makes a nice transition tool. One of the Amish equipment makers, Pioneer Implements (I think from Ohio, USA), makes a nice one – even a model with a 35 hp diesel engine, PTO, and hydraulic control system. Charles Bowden; The Last Horsemen; A Year of Sillywrea, Britain’s only horse-powered farm. With excitement I ordered the cd, but was sadly disapointed by either the way it was edited together, seemed disjointed and not complete, I wasn’t sure what the purpose of the film was ? Although I thought I did before the film. Having two horses myself and learning to working with them perhaps the film wasn’t for me, I don’t know but it just didn’t have the certain magic that I thought it promised. Better luck next time with your next films.